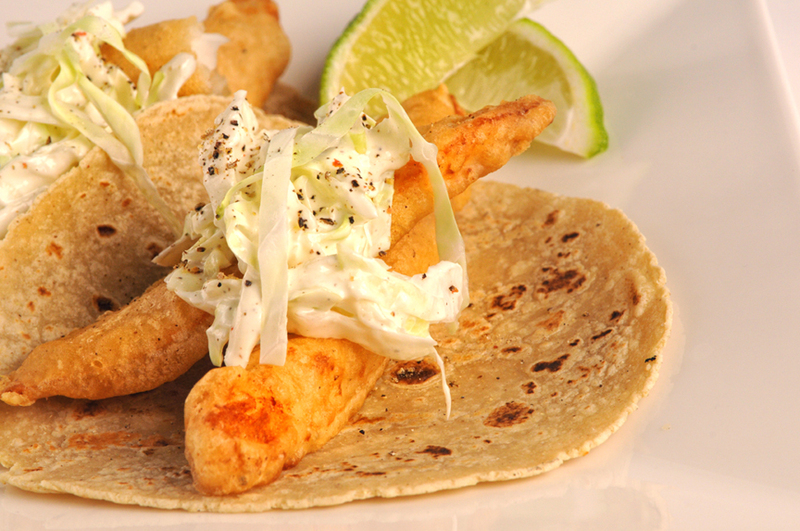 Perfect for your next fish dinner, this delicious crunchy coating and spicy slaw will change your opinion of fish tacos. The fish is dipped in a beer batter and shallow fried to crunchy perfection. The slaw comes together fast and can be made while the beer batter rests. Mix the flour, salt, and pepper in a medium bowl. Gradually add in the beer while whisking. Set aside and let the batter rest for 15 minutes before using. Whisk mayo, sour cream and horseradish in a medium bowl to blend. Stir in shredded cabbage. Refrigerate while you finish the fish. On a large plate, combine the flour and salt. Season the fish pieces all over with salt and pepper and coat with the flour. Working in batches, dip the fillets in the beer batter and coat on both sides. Fry in the hot oil until golden brown and cooked through about 5 minutes. Transfer to paper towels to drain. Make tacos with the tortillas and fish and top each with horseradish slaw, avocado, and squeeze of a lime wedge.